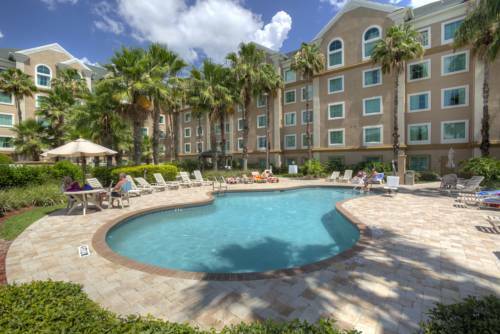 Spend your Orlando visit in comfort, close to everything at this Hawthorn Suites by Wyndham Orlando Lake Buena Vista hotel, just minutes from Disneyworld and other theme parks, 11 miles from Orlando International Airport and close to restaurants and nightlife. Enjoy the convenience of complimentary wireless Internet, complimentary daily paper, laundry facilities and dry-cleaning service. For a great start to each day, this hotel offers a complimentary hot breakfast buffet. Make the most of your leisure time by relaxing in the heated outdoor pool and jetted tub, playing on the sports court or in the game room, and cooking out on the grill. Business travelers will appreciate the meeting space and business center with fax and copy service. Suites with full kitchens are available, ideal for longer stays, and accessible rooms are available.